Wrought iron console sofa tables are extremely versatile and can be used in just about any room of your home. Use an iron console table or wrought iron foyer table to welcome guests in the entry and wrought iron sofa tables to display decorative objects, plants and candles, divide a large room, or hold lamps behind a sofa. The right wrought iron sofa table can easily add to a room's beauty, function and character. All our tables are hand crafted by skilled blacksmiths using centuries-old techniques. Here at Timeless Wrought Iron you will find many beautiful styles and finishes available, as well as your choice of table top materials. Please feel free to browse our collection of foyer tables and console tables below, clicking on any image to learn more about that particular item. Helpful console table information on history, style, size and material. Console tables, sometimes referred to as "sofa tables," have been around for centuries. They conjure up a variety of images for a variety of people. Some people may be more familiar with console furniture history than others, but for those of us who know only the modern rendition of this multifaceted table, we will review a brief history of this unique piece of furniture. It is thought that console tables in their original form, were designed by the Romans first. When they were initially designed, they were created with two legs rather than the four-legged tables we are accustomed to. Originally these tables were designed to be built right into a wall or other permanent structure to give them stability since they clearly could not stand on their own. This kind of design is commonly known as a furniture installation. They were narrow by design, and have retained that design up through modern times. Much ornate consideration was given to the front and top of the table only, as the back was obviously never seen. Many changes and alterations were given to this piece over the centuries to reflect the philosophy of art and beauty of that period. Presently, the modern version of this table has some similarities with its ancient counterpart, but obviously, the greatest difference now is console tables come with four legs, rather than two - Though the two-legged variety can still be custom made and installed. They have kept their original name because the front and top of the table many times will still have some kind of added ornate decoration - Usually in the form of small drawers with elegant or fancy knobs and handles with the back still being quite plain. Sofa tables are very versatile in material and design, featuring everything from wood with glass tops, marble tops, or copper or gold-leaf tops, to wrought-iron or other metal legs with the same kind of tops. They can be relatively cheap or run to the extremely expensive side. They can also be purchased in a variety of period styles to fit almost any furniture decor. These beautiful and ornate tables are much taller than most occasional, accent, or coffee tables, averaging 32"-36," or about hip height of the typical adult. Some varieties are made a little taller - more towards waist high or so. How can I use wrought iron console tables and sofa tables in my decor? 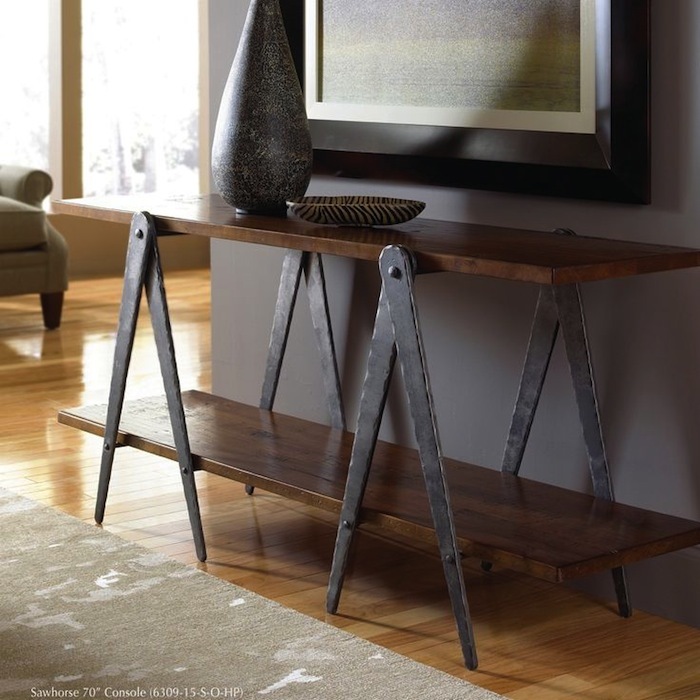 Console tables make a beautiful addition to any decor - from rustic Texas ranch homes to elegant New York lofts. Console tables can be stunning when placed against a living room wall, flanked by two arm chairs or side chairs with artwork hung above. These beautiful tables are often placed behind a sofa to hold lamps or framed pictures, thus their alternative name "sofa table." The decorating possibilities are endless with these lovely, and often practical, additions to any home. 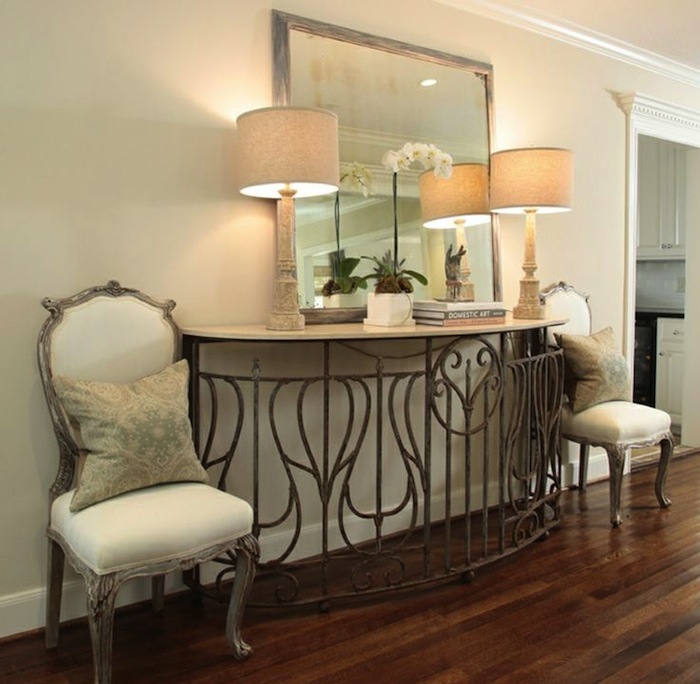 Wrought iron console tables also make great foyer tables. They can be an incredible addition to any entryway or foyer. Decorated with a beautiful arrangement of flowers or a unique piece of sculpture to welcome guests in style. Wrought iron foyer tables are designed to push up against a wall and are sturdy enough to hold any weighted object. Styles vary to help you match with your decor. What sizes & shapes will I find in your collection of iron sofa tables and console tables? Our beautiful tables are much taller than most occasional, accent, or coffee tables, averaging 32"-36," or about hip height for the typical adult. Some varieties are made a bit shorter or little taller - more towards waist high or so. Most are rectangular, while a few are designed with a lovely curved front. Do you offer a variety of styles and types of wrought iron console tables? What materials are used to create your wrought iron sofa tables and console tables? Most of our console tables are designed with hand-forged iron bases, but tops and accent elements may be made of metal, wood and other high-quality materials depending upon your design choice. Learn more about Console Tables from these blog articles written by our expert designers. Every day of the year and especially during the holidays, it's important to greet guests (and family too) with an inviting and visually inspired space just inside the front door. That's why we're sharing "Create Impact with Console Tables in the Entry". Console tables can be used in many stylish ways in living rooms of all sorts. From traditional to contemporary, you'll surely be delighted by the rooms in "Living Room Console Table Ideas & Tips". Need some help with choosing ideal wrought iron pieces for your entryway? 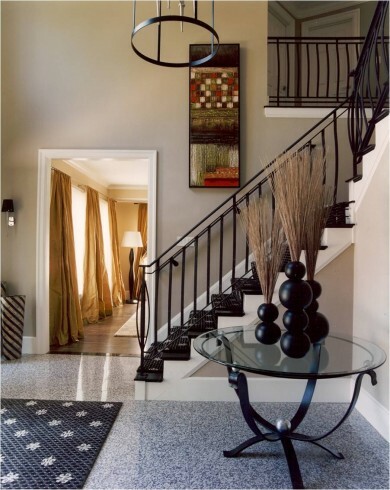 Then, you'll want to check out the great ideas in this post: "Create An Inviting Foyer With Wrought Iron Decor". "25 Ways to Decorate a Console Table". 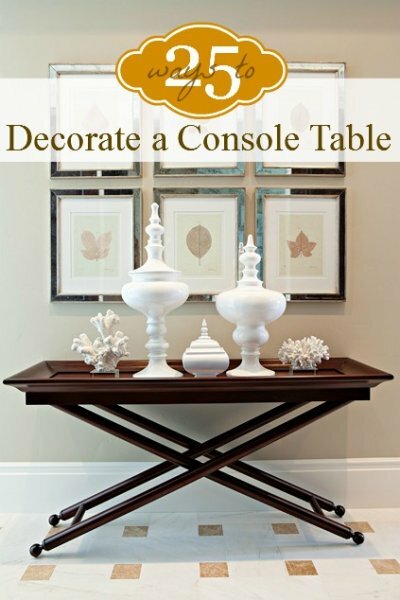 Remodelaholic thoroughly covers how to decorate a console table. From color to collections, you'll find lots of clever and creative ideas here. "20 Fabulous Entryway Design Ideas". 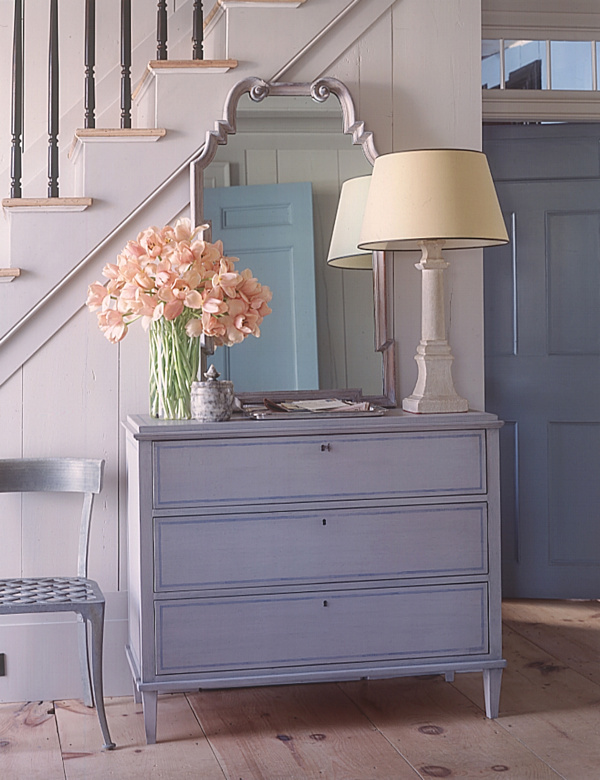 Have questions about how to decorate your foyer? The Decoist comes to the rescue in this very informative and interesting article.